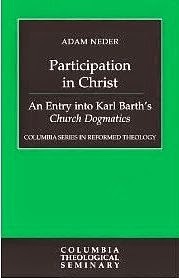 This post begins a series looking at Professor Adam Neder's helpful book, "Participation in Christ (An Entry into Karl Barth's Church Dogmatics)." To read other posts in this series, click on a number: 2, 3, 4, 5, 6, 7, 8, 9, 10. According to Barth, revelation, election, creation, reconciliation and redemption all take place "in Christ," and their meaning and content may only be rightly comprehended in him. In fact, the very being of all humanity itself is objectively included in the being of Jesus Christ, and is likewise subjectively (i.e., by individual people) realized in him. In these acts of inclusion and realization, the creature is incorporated into a depth of fellowship that is nothing less than participation in the being of God. Statements such as these are at the heart of Barth's theology. Yet they cry out for explanation (p.xi, emphasis added). Cry out, indeed! And so we have wrestled with such statements on this blog - ones that surface in the writings of theologians both ancient and contemporary who, like Barth, advance a theology that is incarnational and Trinitarian. Neder gives us a great deal of help in understanding what Barth means when he refers to humankind as "objectively realized in the being of Jesus Christ," yet also "subjectively realized in him." These twin aspects of "in Christ" speak to all aspects of our salvation, including justification, sanctification and calling. Neder observes that at the heart of Barth's thought is the stunning reality of the union between God and humanity that has been forged in the person of Jesus Christ. According to Barth, this divine-human union is one of "active distinctions, which occurs in the communion of free divine lordship and correspondingly free human obedience" (p.xiv). Through his life of obedience for humanity, Jesus Christ objectively establishes the being and identity of humanity. Analogously, subjective participation in Christ occurs in the event of obedience, in which human beings embrace and enact their being as Jesus Christ has objectively defined it for them. God shares himself with human beings by becoming their gracious Lord. Human beings participate in God by becoming his grateful disciples. Thus, participation in Christ takes both an objective and a subjective form, the former being teleologically directed to the latter and thereby guaranteeing its genuine occurrence. Jesus Christ's life history, grounded in election, constitutes the covenant of grace, and therefore participation in Christ is participation in the covenant (p.xiv, italics are included in the original). ...justification, sanctification and calling, which together constitute the objective being of humanity and call forth the corresponding threefold response (faith, love, and hope) in which this being is subjectively [personally] realized (p.xv). How does Barth arrive at these conclusions? The answer involves, in part, his understanding of the nature of divine revelation. We'll examine that important topic in part 2 of this series.